This one was fun! This is my sheaf stitch sample for TAST and I really enjoyed it. 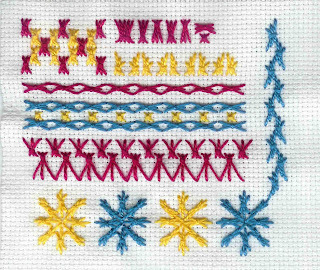 I like the thorny bit down the right hand side and who'd have guessed I could stitch snowflakes with it - I'm really chuffed with those! I think you really did like the stitch and well you should because this sample is fantastic. Wow, a wonderful sampler! I love it, especially the snowflakes and the thorney line. WOW !! That is one wicked awesome sampler :) You did a great job . I love those snowflakes !